by bringing this interior designer’s work a little closer to home. If it takes a special eye to spot a diamond in the rough, then interior designer Leslie Wolfe has twenty-twenty vision – and this time, the diamond was in her own backyard. Leslie, along with help from her team of talented contractors, has transformed a time-worn and dilapidated horse barn at her homestead in LaGrange, Georgia into a charmingly ordered interior design workspace that now houses her design company, Benton Parker Design, and the results are metamorphic to say the least. The project began as a means for Leslie to spend more time with her husband and three children. “I was desperate to find a solution to balancing time between my family and my very full-time job,” she says. “I contacted Jack Jenkins and got him to look at the potential of the barn, and we decided that it would be easy to convert the horse barn into my design barn.” From there, Jack created a rendering for Leslie, who then took on the role of general contractor, and the project was officially underway. The design barn sits right behind the main house on the 60-acre property and is roughly 1,500 square feet. The original building, which was constructed in 2008 and abandoned for a brief period, received a ground-up restoration and has been completely modernized as well as outfitted for Leslie’s workspace needs, which include designing and consultations with clients. The barn is a showspace for sure, but it certainly feels occupied and worked in. Case in point: the office, stock room, and hayloft upstairs are littered with design items used by Leslie when she’s working. The building consists of six main areas: an entryway, a main room, an office, a kitchen, a stockroom, and hayloft-turned-showroom upstairs. The design vocabulary is quite fitting for the charming southern farmhouse feel –reclaimed heartwood pine beams, tongue-and-groove boarding, restored sliding barn door from the original tack room, and even burlap and sailcloth upholstery. A sheer white finish on the walls and ceiling create a stark contrast with the richly finished interior wood designs, and the hand-loomed, vegetable dyed Persian rugs really tie the rooms together. Leslie says that the neutral colors in the barn were designed to be a less-intrusive backdrop so as not to compete with the colors that clients are reviewing. Leslie often shares the workspace with two other designers – Lindsay Slice and Lindsay Higgins – who work with her on various projects. “They are a huge part of my team, and I am so thankful for them,” she shared. TOP: The main room is the first space one enters in the barn. It is filled with a large, wooden table made from reclaimed lumber, which is set beneath a no-pane, lantern-esque chandelier. Aidan Gray did the main table, the upholstery for the dining room chairs is from K. Krypton, and the beautiful chandelier is from Curry and Co. Chandeliers who also did light fixtures in other rooms. All throughout the barn are tongue-and-groove pine board walls with nickel gap, which were installed by Rick Britelle who also did the framing and trim work. Additionally, Edwin Madan from LaGrange helped Leslie create the beautiful beams in the main room from reclaimed heartwood pine. The main room has a daybed, which has been upholstered in burlap and sailcloth. A fiddle leaf fig breathes fresh air into the corner of the room, and its forest green color creates nice contrast with the white walls. RIGHT: Leslie’s office, which is connected to the main room, follows the downstairs themes and has an open feel to it, which comes from the large windows, large doorway, and cutout allowing Leslie to see into the main room from her desk. The cutout was the original opening to the horse stall. The desk was also done by Larry Duquette of Duquette Cabinetry. The chandelier is reclaimed wood from Low Country Originals. TOP LEFT: The kitchen shoots off of the main room and follows the themes of the downstairs area with similar paint and flooring. The countertop is quartz and is complemented by walnut shelves secured with plumbers pipes for braces. The quartz came from MSI and was fabricated by Mike Jenkins of Took for Granite. The custom kitchen cabinets are by Larry Duquette of Duquette Cabinetry. Appliances came from Daniel Appliance. TOP RIGHT: The stockroom is where Leslie queues up items for her ongoing projects and is connected to the main room downstairs. Instead of a traditional door, Leslie transformed the original door from the old tack room into a sliding door to create the entrance to the stockroom. The concrete floors that run through the office, main room, and stockroom were poured by Dexter Evans of Construction Services of LaGrange, who also did the stone work on the exterior. The concrete downstairs was poured over the original dirt floor, and red clay and sawdust were left in the concrete for a rustic accent. The shelves holding the items are industrial style made from reclaimed wood. RIGHT: This area is where Leslie keeps all of her fabrics and wallpaper samples. Originally, the upstairs area served as the old hayloft. The flooring upstairs, also installed by Rick Britelle, is white-oak, which was hand-distressed. Rusty Frazier handles all of the drapery and shutters for Leslie’s clients, and he carefully crafted rods for all of her hanging samples out of plumbers pipe. ADDITIONALLY, The General lighting throughout the barn is from Visual Comforts, Currey and Company and Low Country Originals; and the exterior copper lanterns are from the St. James Company. Building materials, windows, and doors were all from Valley Fir, and the iron spindles were by Aaron Land of A&D Metal Works. Leslie Wolfe is married with three kids and lives with her family in LaGrange, Georgia. She is the owner of the interior design company, Benton Parker Design, which was established in 2006. Her mother inspired her to design by taking her to antebellum homes and architecturally stunning locations in Europe as a child. She attended Auburn University and received a Bachelor’s degree in interior design. She strives to embrace the style and taste of her clients and has done so on many occasions throughout her professional career. Located in the highly sought after area of Midtown, this charming, 2,600 square foot home, a Colonial Revival style, was originally built in 1945 for Mr. and Mrs. Joseph Julius, President of Acme Laundry. The home has kept its original charm, but has been given a refreshing look with a stark white for the majority of the house accented with an iron ore color by Sherwin Williams on the window trim. Its main architectural features are centered on the front entry with a welcoming arms staircase and classic Doric columns over the pediment. Upon entering Chris' home, one can look all the way through the hall, to the den, and outside to the garden beyond. Light flows throughout this home and original glass pocket doors allow Chris to open up or separate the adjoining rooms. A large-scale print wallpaper adds visual interest to the foyer with two corner chairs that look as though they were made for the space. Chris' late husband Mark Porter was on the collection committee at the Columbus Museum and that is what inspired their love for art which is seen in this space and throughout this 1940s home. Chris purchased two modern art pieces at Scott's in Atlanta to add a punch of color to the dining room's neutral color scheme. The round pedestal mahogany table, Chippendale chairs, and English mahogany sideboard from his grandmother give the dining room a traditional feel, while the chandelier and crystal sphere lamps add a modern touch. This elegant room makes for a great entertaining space for Chris and his guests. This room, besides being a space to watch TV and gaze out to the garden, also serves as Chris' office. The upholstered chairs in a greek key design give this side of the den style an comfort. The painting below was a wedding gift to Chris and Mark from Amber and Charlie Mordic. it was painted from a photograph of the two of them on their wedding day in New York City. Large windows, sidelights, and a glass paneled wooden door allow the interior to flood with light. Lush green landscaping and elements of rod iron really make the house stand out. Purchased just a year ago by local landscape designer Chris Harman, the home has been beautifully updated in the interior spaces and the landscape of the property. Neutral tones with grey and black accents reflect the exterior of the home in this master bedroom. Elements like the collection of art framed in bamboo and the combination of fabrics give the master bedroom a subtle Asian feel. Custom made draperies, in a repeating trellis pattern by Thibaut, give the room some geometric interest and Carlton V fabric in the print, Puff, ties the room together. The room makes for a calm, serene retreat at the end of a long day. 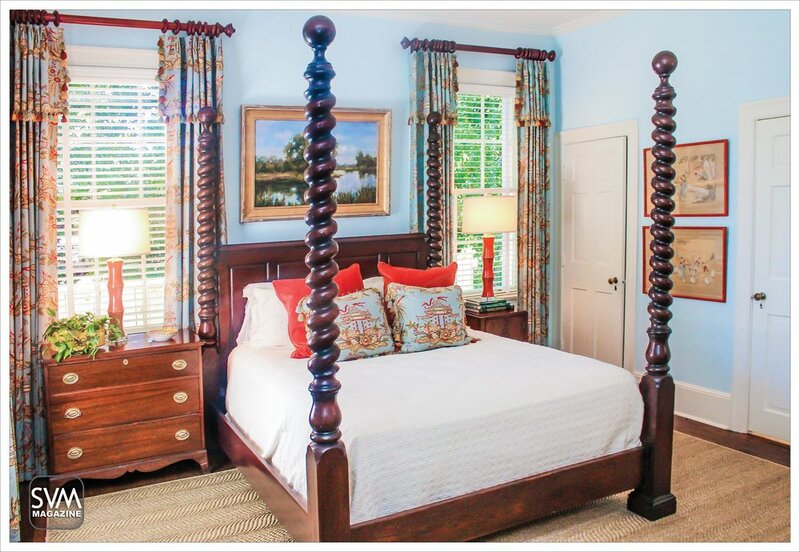 GUEST ROOM: An EJ Victor four poster mahogany bed gives this guest room a large focal point. Thibaut fabric draperies and pillows add an Asian touch which is carried throughout the home. The pop of red-orange in the shams, and the bamboo inspired lamps provide a modern touch to this traditional room. A herringbone patterned straw rug adds a layer of texture and makes for an inviting place for guests to stay. The compact, but super functional kitchen was completely redesigned to allow a custom island, topped with honed Georgia marble from Innovative Marble. New island cabinets from Peach Cabinets were built and Jenn-Air stainless steel appliances from Daniel Appliance were installed. Jeremy Frost with Precision Floors laid the hardwood floors throughout the home, including the kitchen, and Chris had them stained in a rich Jacob Bean. The back splash is an arabesque shaped Carrera marble tile from Jenkins, and Mitch Goare installed the the two inch wooden window blinds. 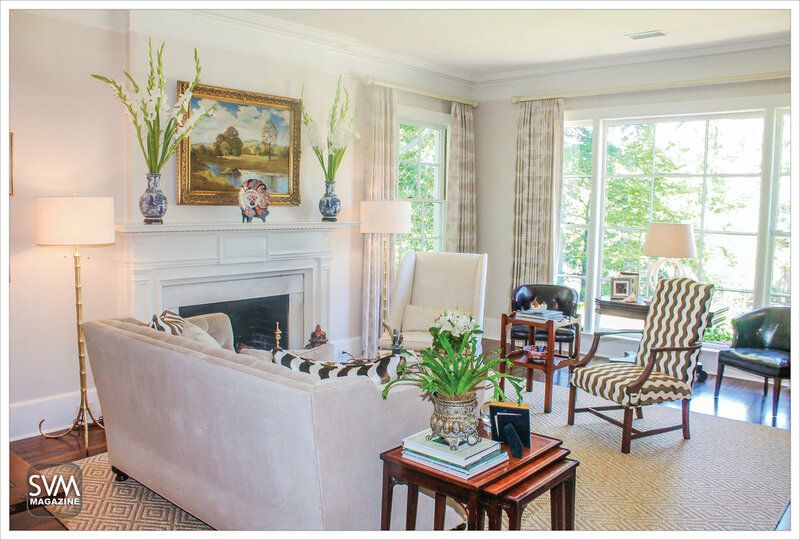 Betsy Illges helped Chris choose the brown and white Miles Redd Schumacher fabric to add not only a visual interest, but something unexpected in the home's formal living room. This gives the room a modern, edgy feel without it being overwhelming. The painting over the mantel, once hung in the Governor's mansion in Illinois, and is flanked by two blue and white Chinese porcelain vases. The tufted sofa is beige velvet and the vintage burgundy leather barrel-back chairs are from the 1940s. The blend of these styles create a well-designed living room. An 80’s cape cod style cabin gets a face lift when the Peeks turn their waterfront property into a rustic, modern oasis for the whole family. A s the heat of the summer seems to last almost year round in Georgia, residence search for a cool escape. Luckily, Georgia has some of the most pristine lake front properties available. When Rachael and Will Peek were searching for their new getaway home, they fell in love with an 80’s cape cod style cabin that had a stunning view of Lake Harding. It was clear the home needed a little TLC, so the Peeks decided to make it their own with some major renovations. “We didn’t want to end up with a large home, but one that feels comfortable for our family of five and could be used as a guest house,” Rachael Peeks explains. 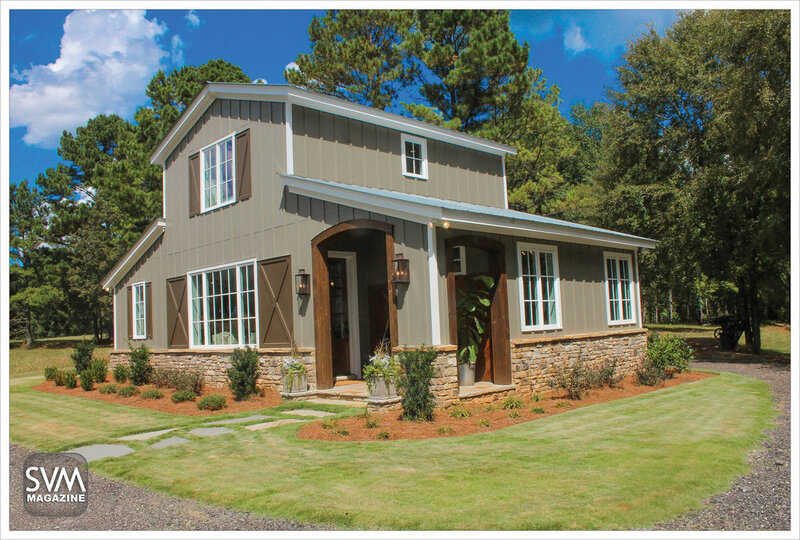 The family called on contractor Tim Gregory to create a home that would fit their life style. Needing to reinvent the floor plan, they found themselves striping the house down to it’s bones. By raising the roofline of the home, they were able to add a second story with a spacious bedroom and bathroom for their children. “We didn’t want it to feel like a finished attic space, we wanted it to be a comfortable room for the boys,” Rachael explains. They added a boat house so they could also enjoy Lake Harding from the water. The home originally had two decks, so the family decided to improve one deck and expand the kitchen onto the other deck. With an opened floor plan, their vacation home truly feels like an oasis as they are able to host family gatherings and watch their kids spend time with one another. The Peeks drew inspiration from their exquisite view, as blue and soft green hues throughout the home resemble the water surrounding their property. Easily becoming their favorite room in the house, the Peeks back porch has plenty of seating for family dinners looking out over the water. On cool summer mornings, you can find Rachael Peek enjoying coffee and a book on the side deck. The use of reclaimed wood from an old home in Hurstboro, AL to make the railing, kitchen ceiling, and bar countertop add character to the home. The spacious kitchen encourages pro and amateur cooks alike. As a staple of any family home, the kitchen flows into the family room, where you can find the Peek’s children relaxing after a day on the water. Although you may want to hide away in this home, the beautiful yard landscape, created by Pete Page, draws the family into the yard for roasted marsh mellows and flag football. The getaway is just a short drive away from their home in Fortson, GA, making it as accessible as it is beautiful. The back porch provides tons of seating with these antique, tin stools and a large couch. The family mixed floral and striped prints to give the outside space a casual, fun aesthetic. The bright blue and yellow colors pair seamlessly with the view of the water. With abundant views of Lake Harding, the Peek's refurbished side porch is the perfect place for a family breakfast. The Peeks dress the table with orchids and surround it with four wicker chairs for seating. With a hogwire railing, one's view of the lake is unobstructed. 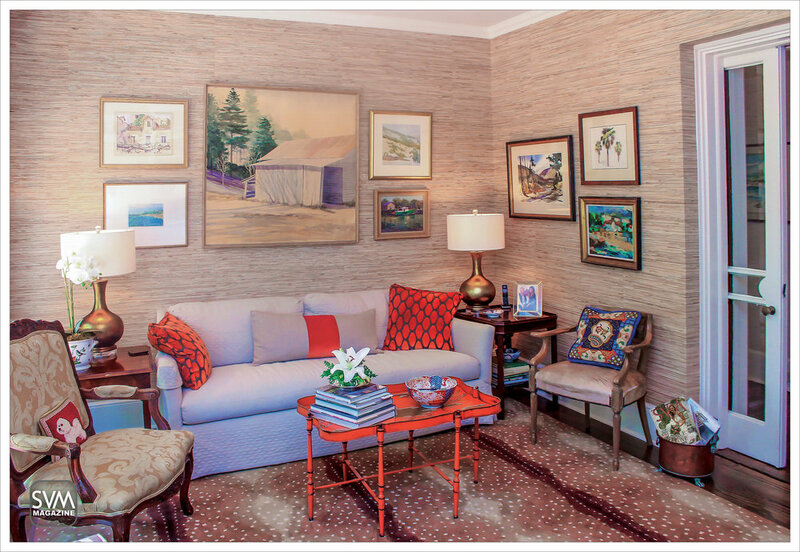 The family room is the heart of the home, and this living room reflects the family’s vibrant personalities. The wooden floors throughout the home were found under the carpeting of the original house, and have been restored by Bone Flooring. The light fixture from The Big Chandelier gives off just enough brightness, without overpowering natural light from the huge windows. The coffee table from Currey & Co. has been the make-shift table for many dinners in front of the TV. The remodeled master features a beautiful, wooden stained ceiling and huge windows for added natural light. The warm taupe rug from Flooring and More adds comfort, while the textured blinds by Berendt Company Shutters let in the desired amount of light on sunny mornings. 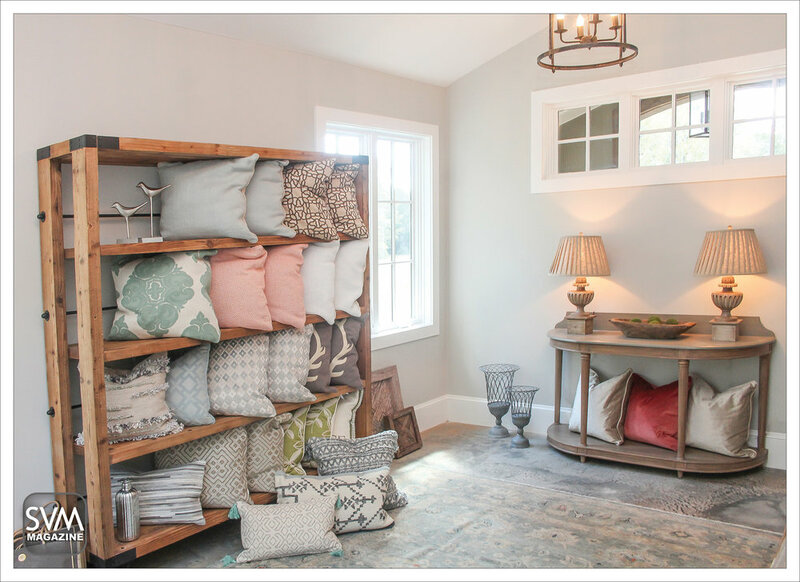 The throw pillows from Romo Fabrics bring color to the room. The guest bedroom features a reclaimed wood closet door by Tim Gregory and white furniture. The bright comforter and extra bench seating makes this room a guest favorite. The upstairs bathroom features a claw foot tub and a custom made marble top vanity which offers views of the front of the house. The stair railing, made with reclaimed wood by Tim Gregory, leads you to the newly built, second floor of the home. The high ceilings allow for a wet bar and seating area under the stairs. The wooden legged bar stools and reclaimed wood counter top add rustic charm to this space. The beautiful expanded kitchen is Rachael Peek’s favorite part of the house, and it’s clear why. Originally an extra porch, the family enclosed the porch to create a large kitchen. The fixtures, from Ferguson Enterprises, break up the rustic pieces with modern elements. The off white cabinetry, by Braden Berendt, shows off the tall, reclaimed wood ceilings by Tim Gregory. The rustic light fixture, by The Big Chandelier, makes the marble counter tops, fabricated by Joe Waller, the belle of the ball. The stainless steel appliances are all GE from Harvey’s. The kitchen bar stools from Serena & Lily offer a casual seating area for the family. With a perfect mix of the sleek and the sublime, the Harris' home in Green Island radiates a refined and understated glamour. The home of Dr. and Mrs. Jay Harris boasts a design that is both contemporary and Georgian. Nestled in the beautiful Green Island Hills neighborhood, the home exudes a youthful vibe perfectly suit for a young family while at the same time staying true to the ar- chitectural roots of the region. The house was built in 1938 for Mr. Edward Swift Shorter, with Atlanta’s Henry Tombs serving as the home’s original architect. Over the past eighty years, the home has changed many hands andwithstood the tornado of 2007 until finally falling into the graces of the Harris family. Prior to touring the home, Dr. and Mrs. Harris believed that they had madea final decision on where to move their family. A lot had been purchased,house plans had been drawn, and building was about to commence on what they thought was to be their new abode. When Mrs. Brittany Harris’s real- tor advised her to look at this house before building began, the home had been standing empty in Green Island for the past three years. While it wasnot love at first sight, something about the home convinced the Harrises toforgo their building plans. Perhaps it was the classic white painted brick, or the perfectly private location. Regardless, during her last minute visit Brit- tany knew that she could see her family inhabiting the charming residence for years to come. With features from their original building plans already in this gem of a home, all that was left to do was make it their own. Under the guidance of architect Jack Jenkins, a floor plan was drawn out tobetter suit the family. After they purchased the home in 2015, four months were spent renovating mainly the main floor. The kitchen and master bed- room were relocated, and a small dining area was added. The bright roomsfull of natural light, open floor plan, and Beth Beaudoin’s interior designcomplement what remains of the home’s older architecture. The four bed-room, four bath sits on five acres and features a guest house, a wine cellar fit for 500 bottles, and a stunning pool and pavilion redone in 2008 after the2007 tornado by Superior Pools and Jack Jenkins. These are just a few of the home’s beautiful qualities. The redone interiors are what truly set this home apart from the rest. Interior designer Beth Beaudoin says, “Working with Mrs. Brittany Harrison this project was so much fun and a true collaboration. She has a definitepersonal style, and we worked hand-in-hand to bring her vision to life. The Harrises had some great existing pieces to work with, and we layered innew pieces that we sourced from all over! Brittany is a dedicated research- er, so she was the perfect partner to help me put this puzzle together. This home truly reflects Brittany and Jay and is a perfect fit for the precious Harris family”. Join SVM as we show off this unique Green Island treasure. The citron sofa adds a splash of color to the otherwise neutral hued study.The Zak & Fox and Schumacher pillows tie in perfectly with the black and white photography by Suzanne Hughston. The Moroccan wool shag rug and chandelier from West Elm make the room feel chic and polished. The kitchen opens up to the bright and airy living room. The largely neutral room is accented with eye catching splashes of persimmon and turquoise. The Lee Industries sofa and chairs with their neutral Jane Churchill-Adler fabric serve as blank canvases for both the bright floral Brunschwig & Fils and turquoise Manuel Canovas pillows. The sleek concrete and steel custom cocktail table is byBrent Miller. The black marble fireplace has remained untouched since 1938 and perfectly comple-ments the black wooden chairs by Noir and the dark walnut finish of the wood floors. 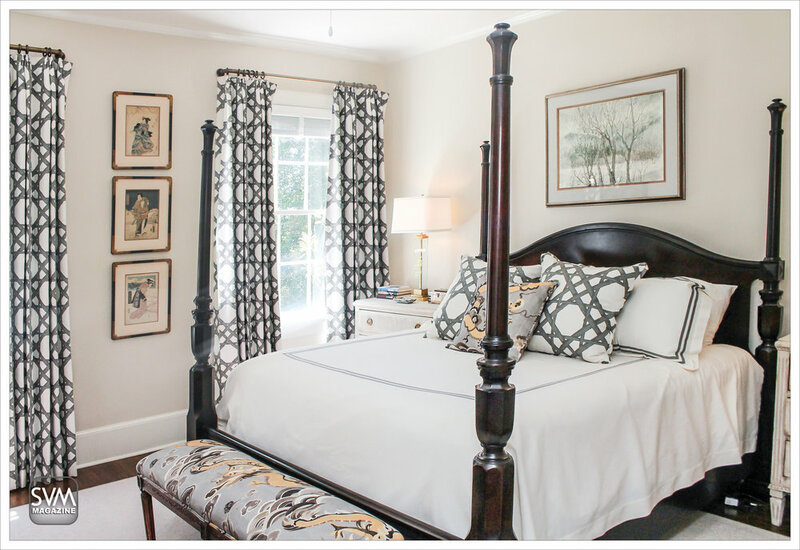 The master bedroom is another product of the Harris’s renovations. Originally the space for the den, the chandelieris another original fixture. The fourteen foot vaulted ceilingand crisp white walls give the room a modern feel, while the four poster mahogany bed, custom bedding from Legacy Linens, toile fabric pillows and drapery by Schumacher,and antiqued mirror dresser from Restoration Hardwareensure a traditional Southern touch. Originally the master bedroom, this bedroom features a peach al-cove fit with a chandelier from Stray Dog, beautiful Pine Cone Hillbedding, and spunky throw pillows with fabric by Columbus native Lulie Wallace. With built in window seats overlooking the terrace on the opposite wall, this room is a girl’s paradise. The light toned blues and greens present in this room create the ideal space for the Harris’s daughter Anna to play and relax. The light blue walls perfectly comple-ment the retro floral pattern shams and the green dust ruffles. Standing where the original formal dining room was, the kitchen features a gorgeous carrara marble island with a stainless steel apron sink and overhead lanterns from Circa Lighting. A six burner wolf gas stove complete with a custom zinc stove hood by Ed James of Cotton Custom Metals resides opposite the island. The Harrises added the breakfast room duringrenovations, and fit it with drapery by Galbraith & Paul and a bamboo chandelier by Currey & Co. The doors leads out to a screened in porch perfect for outdoor dining. Located right off of the pool, the basementfamily room was also redone in 2008 by Jack Jenkins following the tornado. The brick floorsallow for the children to come into this Spanish inspired room still dripping wet from a swim, making this the perfect space for gatherings with friends. The backyard gardens is a personal oasis for the Harrieses,and its easy to see why. They created an environment that brings the outdoors in and the indoors out with right decoration and space.A cement coffee table adds an element of ageand can withstand the himidity. Perhaps one of the best features of the home, the pool pavilion was redone in 2008 by Jack Jenkins after tornado damage. Superior Poolscreated an outdoor oasis that can be used year round (the family loves to heat the pool on Christmas Eve for a dip in December!) With outdoor furniture from Restoration Hardware, and an outdoor concrete table by Brent Miller Designs, this pavilion is the ideal space to enjoy time outside, no matter the season. A piece of Italian fantasy comes true when the McGrory’s moves into a house they had long coveted, transforming it with their own bold vision. When building her north Columbus home, Kate McGrory sought inspiration from all over the world. She fell in love with this Tuscan inspired home via her Texas roots. She had left behind her dream home in Ft. Worth and wanted to recreate the style of many Ft. Worth homes here in Columbus. Her family broke ground on her new house in 2013. She was torn between the Italian style she loved and a beautiful French style. It seemed inconceivable that she would choose anything but an Italian style. “When it came time to look at oor plans and house styles, we kept going back to that style,” she explains. The rustic Tuscan home, which has four bedrooms and four and a half baths, in Stonewood Farms, is located in perfect proximity to their lake cabin, places of work and children’s school. The plot is ve to six acres, allowing for ample space for their family.